Sodium alginate (SA) is a linear biopolymer, which is the nontoxic, biodegradable, and rich in carboxyl and hydroxyl groups. 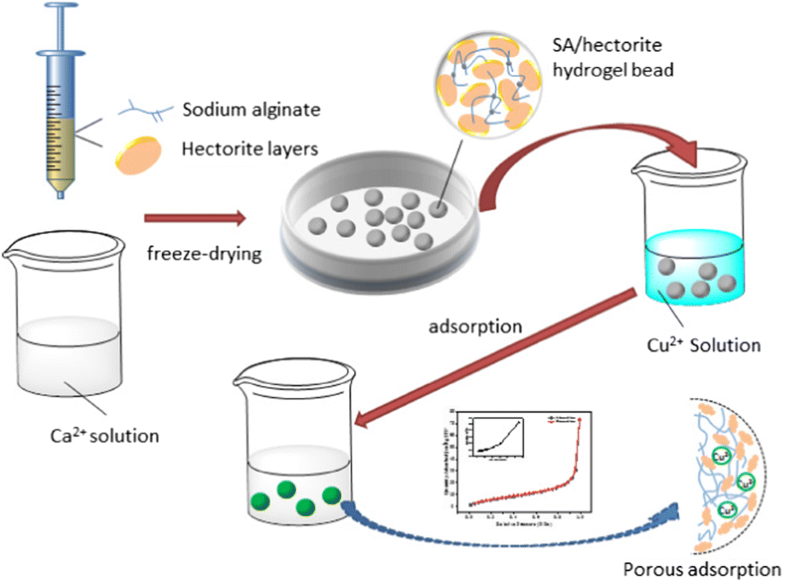 In the paper, the SA-based hydrogel bead was prepared by the cationic hectorite clay and anionic sodium alginate with a simple ionic gelation method under freeze-drying, and the adsorption properties were evaluated by the removal of copper ions from aqueous solutions. The composites were characterized by X-ray diffraction (XRD), nitrogen adsorption-desorption isotherm (BET), thermal analysis (TG), and Fourier transform infrared spectroscopy (FT-IR). The pseudo-first-order and pseudo-second-order kinetic models were used to describe the kinetic data and the Langmuir, Freundlich, Dubinin–Radushkevich (D-R), and Temkin models were applied to describe the adsorption isotherms. The results showed that the adsorption process was found to follow the Freundlich isotherm model and the maximum sorption capacity was observed to be 160.28 mg/g under the initial concentration from 10 to 700 mg/L at 45 °C. Adsorption kinetics data fitted well with pseudo-second-order rate model. The porous structure of the composite was responsible for the adsorption of Cu2+ ions. But the adsorption ability could be improved by pH. Finally, the adsorption mechanism was suggested. 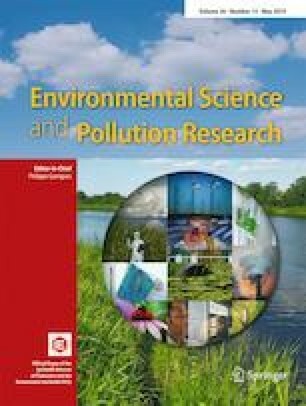 The authors wish to acknowledge the National Natural Scientific Foundation of China (21506188), the Natural Scientific Foundation of Zhejiang Province ZJNSF (LY16B030010), China Postdoctoral Science Foundation (2018 M630688), the project from Science and Technology Department of Wenzhou (G20180017), and Project of Zhejiang″151″ talents project.